Are you looking for a mid-size cooler to carry your lunch, drinks, and snacks to a party, on a day trip or for a day in the office or at work? If you are, the RTIC SoftPak may be exactly what you are looking for. It’s not too large and has ice retention capabilities that match many of its more expensive competitors. "Over Built, NOT Over Priced". Our in-depth review finds out how true their advertising is. We look at the RTIC SoftPak 30 cooler in detail to find out whats good and bad to help you decide if its right for you. When it comes to value for money, you can’t look past the RTIC SoftPak range. With waterproof zips, large capacities and the ability to stay cold for several days, nothing else really comes close. At half the price of the equivalent YETI Hopper 30, this is a top performer at an affordable price and comes highly recommended. The SoftPak 30 cooler is delivered in a sturdy cardboard box and is wrapped in plastic. When you open the plastic wrapper and unzip the lid, you’ll quickly notice how thick the insulation is. Even though the cooler contains thick insulated walls, it is still incredibly light when it’s empty. Inside the cooler, you’ll find some zipper lubrication and a shoulder strap. One thing we noticed was how tight the zips are when you first get the cooler. The zipper lubrication will help with this, but the tightness is also because the zipped compartments are designed to seal and to be waterproof. We were quite surprised by the thickness of the insulation and were left with no doubt that the cooler was up for the task that lay ahead. The side walls are an inch thick and the tight-fitting lid is a full 2 inches thick. A tight-fitting lid means you can leave the lid unzipped to give instant access to the contents, while still retaining the cold air. An anti-microbial lining on the inside wall makes it waterproof and resistant to mold. When you first open the bag, you may notice the smell of the glue and liner. This goes away fairly quickly once you start using it – but it can take you by surprise when you first open the cooler. You can always pop a box of baking soda inside the bag for a day or two if the smell doesn’t disappear within the first couple of uses. RTIC SoftPak coolers use a numbering system that represents the number of cans they can hold. It’s rather convenient that this also equates to the number of pounds of ice it can hold. Eg. The SoftPak 30 is designed to hold 30 cans or 30 lbs of ice, and the SoftPak 40 is designed to hold 40 cans or 40 lbs of ice. When it comes to usable space, the interior size is 13 x 9 inches and 9.5 inches deep. Bottles and cans can be packed a variety of ways and the soft sides allow you to fit items in that may not necessarily fit inside a hard plastic casing. Large bottles can be placed on their side with plenty of room to store food or other items above them. The cooler can easily hold 6 full-height wine bottles and still have space to spare. 16 or 20 oz bottles, cans and other items can be stacked standing up or on their side. Ice packs can be placed between or on top of items, and the waterproof walls allow you to pack the cooler with loose ice if required. Even with 16 oz bottles, there is enough room to store additional cans on their side and still have room to close the extra thick lid. RTIC provide the cooler with zipper lubricant for good reason. The zippers are designed to be waterproof, and as such, they can be quite tight to open and close. As mentioned earlier, having a tight-fitting lid means you don’t need to keep zipping and unzipping the lid all the time. However, the side pocket is also designed to be waterproof and can be quite difficult to open and close at times. RTIC recommend that the zipper is lubricated on the docking (closed) end from time to time. It should also be applied before long-term storage and whenever the area is dry for extended lengths of time. You have to be a little bit careful, as using too much lubricant can stain the fabric. The front pocket of the RTIC soft pack cooler is large enough to hold a cellphone, wallet or keys and is also protected by a waterproof zipper. A rear mesh pocket is made from a very tough rubberized material. The pocket isn’t made from simple netting and is designed to last. It’s good for holding items that can get wet or don’t need waterproof protection. The outer skin of the cooler is made from a tough and puncture resistant heavy duty nylon. It takes a lot of effort to damage or puncture the tear resistant fabric. One of the things we really like about the SoftPak coolers are the loops running down the back and front of the cooler. These allow you to hang extra items or to tie the cooler down on the deck of a boat or the back of a motorcycle or jetski. One thing we do find annoying is the bottom buckle. It hangs below the bottom of the cooler, and when you place the cooler on a hard surface, the buckles have a tendency to slip underneath and to make the cooler sit unevenly. This is easily resolved by tieing the bottom buckle to the bottom loop or using a climbing caribena. There are plenty of handles and pickup points in the RTIC SoftPak cooler. The removable top strap is fully adjustable. It has a padded section where the strap hangs over your shoulder. When the strap is detached, the connecting points can also be used as a tie down point. As well as a range of sizes, RTIC SoftPak coolers are available in a wide range of colors. Black and Blue are the most popular colors and tend to sell out quite quickly. The Blue/Grey color (two variations) is quite smart and normally in stock. This cooler holds 30 cans with enough room left for an ice pack or loose ice. The same size YETI only holds 24 cans. Once the lid is zipped closed, you can hold the cooler upside down and it won’t leak water – even if the ice is completely melted! Having thick insulation and a tough outer nylon wall results in the outside of the cooler always stays dry and never sweating in the heat. Most coolers only have an inch or less of insulation in the lid area. Who is the RTIC SoftPak 30 for? A great personal and family cooler that’s designed for work, trips away and leisure activities. According to the RTIC website, the SoftPak cooler can hold ice for 5 days. While this may be true in ideal conditions, the real world figure is closer to 3 days (or 74 hours). To understand the difference, you need to understand how cooler tests are carried out. Because the cooler body now matches the temperature of the ice, the ice remains solid for several hours before it starts the melting process. When the cooler is not pre-chilled, the heat stored in the walls of the cooler starts the melting process as soon as the ice is applied. What is the "Real World" Ice retention result? When it comes to the real world, people don’t prechill their coolers and instead load them with drinks and ice just before they’re about to head out. In our real-world test, it took just under 74 hours for the last of the ice to completely melt. At the end of the test, the melted ice and water bottles were still cold to drink. One of the most popular competitors for the RTIC is the YETI Hooper 30. The first thing you are going to notice is the price difference. With the RTIC running at about half the price of the YETI, it is certainly worth serious consideration. Even though YETI doesn’t publish the amount of time they can hold ice, real-world test9ng has shown that the YETI Hopper can keep ice for about a day longer than the RTIC. 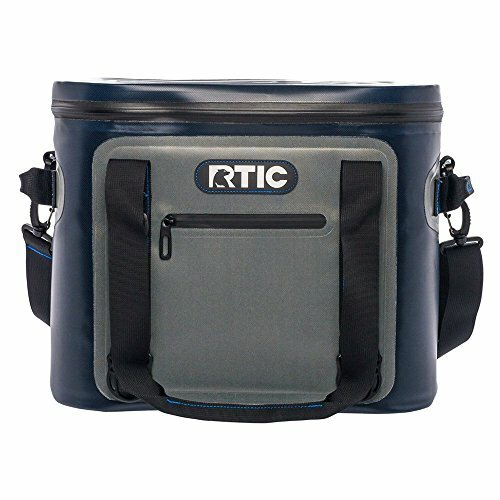 The RTIC SoftPak 30 cooler is well built, has an excellent capacity and good ice retention. When you compare the price to the YETI Hopper 30, the decision is a no-brainer! The RTIC SoftPak 30 is roughly half the price of the YETI. We love the fact the cooler has waterproof zips and doesn’t leak water when it’s turned upside down. It floats if it falls overboard, and comes in lots of interesting colors and designs. The extra thick lid really helps to keep the cold air inside and allows you to leave the lid unzipped for easy access at a party or event. These combined features really make the RTIC stand out from other soft-sided coolers. Other than the YETI coolers, nothing else comes close with value for money. If you have a large family or go away on longer trips, you may like to consider the RTIC SoftPak 40 which has similar features and extra capacity.